The third transnational meeting of Sharetrain Project was held in Pau, France, on 19th, 20th, 21st September 2018 and was hosted by our partner ISFEC Aquitaine. The main aims of this meeting have been to carry out the follow-up, evaluation and dissemination measures requested in this phase of the project; to make the necessary modifications and readjustments of planned activities; to plan the pending tasks to produce a useful, fine-quality tangible outcomes during the following seminar in Valladolid. 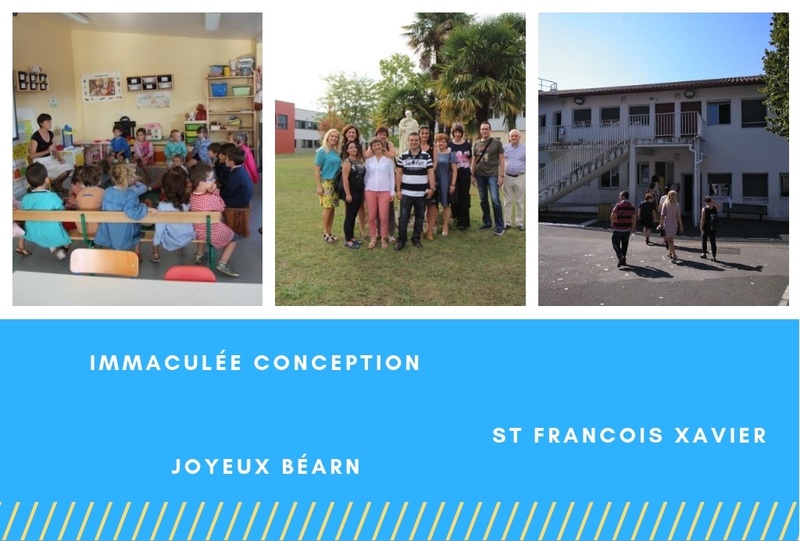 The transnational meeting took place at Pau, North of Aquitaine, instead of Bordeaux, as a way to show the variety of schools and educative contexts in the area in which ISFEC Aquitaine takes part. Thus, this meeting was a bit specific, as it did not take place in ISFEC Aquitaine’s proper building. The major part of the meeting was host by “Immaculée Conception School”, in Pau. Two workshops were dedicated to the project’s follow up: one on the first day (Wednesday 19th), the second one on Friday 21st. 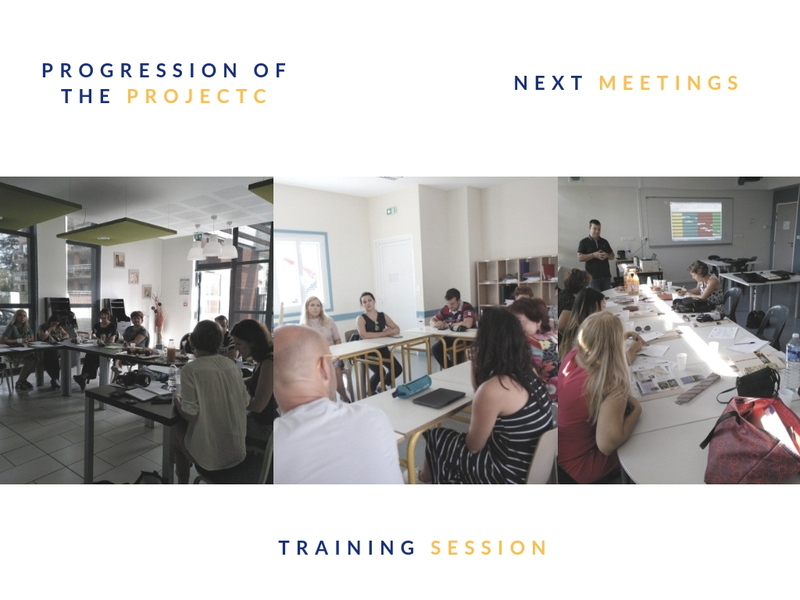 We were thus able firstly to discuss about the progression of the project, to discuss about the next meetings and training session and fix their dates. We also worked on the construction of comparative document needed for the training session which will be held in Valladolid: definition of mobile learning and criteria for the comparative documents. The first day, we visited the primary, lower and higher secondary schools of the Immaculée Conception. We observed an art course, a biology session based on autonomous learning; we discussed about the use of i-pads during biology courses with a biology teacher in Higher Secondary school. We finally observed 3 maths courses at primary school. On Thursday 20th, we visited the western part of Pyrénées Atlantiques: firstly, we went to “St Francois Xavier” in Urrugne, a trilingual school from kinder garden to Primary stage. Here, the students start learning Basque in kinder garden, then they start learning Spanish during the second year of kinder garden, and finally English during the 3rd year of primary school. The method developed by the RTIGAL method. We observed three lessons, and then we had the opportunity of discussing with the headmasters and the teachers. In the afternoon, we visited a lower secondary school, where a project of teaching with i-pads and the empowerment of students are implemented. We had a long debate with teachers and the headmaster about the projects and innovation proposals. The last day, we visited again the school “Immaculée Conception” in Pau, specifically the vocational school. We had the chance to visit the workshops for manufacturing, electricity, heating, nursing, etc. We could see students at work and could exchange experiences and good practices with the teachers. Finally, we finish our meeting by the visit of school “Joyeux Béarn”, in a popular area of Pau. There, after a presentation of the school, we observed two workshops of philosophy with children, with a final debate with the teachers. We also visited the music project “El Camino”, in a school adjacent to the previous one, related to the use of music to develop values and get a better social inclusion. School visits were varied to show to our partners a range of schools in this area, and above all, in Aquitaine. For each visit it was asked to the participants to write a note about their impressions. This note will be transmitted to each team. We are very grateful to the headmasters, the teachers for having taken time to welcome us, to explain how they work and exchange good practices. An official dinner in a Restaurant of Pau. The visit of surroundings in Basque country was included between the school visit. These social times were much appreciated by all participants. As for each session, the general atmosphere was relaxed and friendly. Thank you Pau partners. We felt like home!